here. there. everywhere. 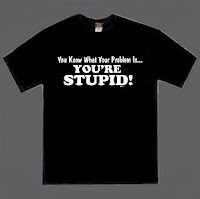 : stupid is as stupid does..
i think people with blogs are stupid! i mean the ones like me, with no real talent or life to speak of. it's not like i'm an artist and i need this out-let for my brilliant genius to flow through, not like i have this interesting,happening life that needs to be put up out there for the world to see and admire and learn from. nope. nothing happens to me, and i insist on showing the world exactly how little i have happening here. like facebook wasn't enough! i could go on and on about how much i hate fb, and how there's never enough privacy... but i still log on.. everyday! i have a lot of things i could say in my defence, but i'd rather not for now. point is, for regular people with regular lives and random thoughts, there is fb , being reuters! so..
but i blog. with nothing of consequence to say or do, i blog. i'm not sure there is a reason (no its not for attention! no one even reads my blog), except that i like it. i've heard people say that in other contexts. like, "i hate the taste of alcohol, but i dont know why i drink it" or "i dont enjoy smoking but i do it sometimes, dont know why".. and the award-winner, "i love my wife" and you still have a girlfriend because? "i dont know." so i guess i'll still maintain, like reluctant smokers, dopers, drinkers and cheaters... bloggers like me are stupid..
my blog is like my mistress i sneak out to see every other day. - no nonsense -- straightforward stuff. ''the only math i know is how to read the time...'' -- hahahahhahahahahahaah. so ur not in Pune anymore huh..
Now I'm curious... Jack D?